You must make reservations at least 5 minutes in advance of the time at SoSo Food Club. Unconventional takes on regional Chinese cuisine, all made in-house, using sustainably sourced ingredients. It was really good! All the portions were really good in terms of sizing! Small bites and quite authentic, a lil spicy which I loved! One thing I really wish was that the whole place wasn’t so dark... I get it’s for the vibe and the deco was great, but it was just so dark I couldn’t see ANYTHING, I had no clue what I was eating unless I put it straight to my face. Please turn the lights up a little more! I made a reservation and was able to get my table within 5 minutes of the scheduled time. We decided to split 6 dishes among 4 people. We ordered 2 Cold dishes, 2 hot dishes as well as 2 orders of noodles. The food was delicious. It was mainly inspired by Northern Chinese dishes. For apps, we ordered the Woodear salad, seabream, meatballs and turnip cakes. It was delicious but the servings could have been bigger. These appetizer dishes were priced between $7 -$19 - so I would expect a little more food. We got the Biang Biang noodles and Soso sesame noodles as our mains. They were full of flavour. Would definitely recommend. Just be mindful of portion sizes to avoid disappointment. Came here for my birthday dinner because the vibe is always great and food and drinks are top notch. Kevin was amazing! He recommended all of our wine choices based on our likes. I had a few extra joiners and he was very accommodating with extending the table size. He even brought a birthday shot out at the end. Love SoSo! SoSo Food is pretty great! It's not the best food I've had but it's solid and for the price, I'd say excellent. They have a great half price wine special on Wednesday and the server let me try two samples before we decided which I loved. The atmosphere is very fun and loud but we could talk and hear each other no problem. The dishes are innovative and yummy. Great place! So pleasantly surprised by the flavour combos and offerings. Our server was so patient and made excellent recommendations. I have already recommended this restaurant to my friends. I’ll be back!!! Amazing flavour, and quick service from the kitchen. Our server was nicer towards the end of our meal, however he felt a bit standoffish and wasn't super friendly or helpful at the beginning when we asked for advice/recommendations. The bartender was very friendly and welcoming as we came in and when we left. Would definitely come back with a larger group so that we could order everything. Sat at the bar and was served by a handsome Aussie who was incredibly knowledgable on their cocktails, beers and wine selection. Food was OUT OF THIS WORLD good - the addition of the prawns, donuts and meatballs was a genius move. Forever a favourite spot for me - whether an occasion, or just a few pals hanging out. Great food with a fun and playful atmosphere. Definitely worth a visit. Lamb noodles are a must. Love half price wine night! Food was awesome! Kevin was awesome! It was a little quiet in the room in the back. I am a fan of louder music, it seemed like there was no music in the back area. Just felt a little cut off from the rest of the restaurant. Great food and a fun environment; we opted for the tasting option and it was really great. I had made a reservation, but when we arrived we were told that the table was going to be occupied for another 30 minutes. BUT, the food definitely made up for the inconvenience. Definitely more than just So-So! Great food! I miss the old chef though. The new stuff is good, but not really that exciting. We had heard about this place but never visited it yet. Then we heard they were introducing a new menu so figured we'd give it a shot. Ambiance - The vibe was really cool. Kinda like a scene out of an 80s Miami Vice episode. The place was quite busy even for a Wednesday night. It was a bit loud to have conversations over but I think it was just because we sat next to a table of 6 basic B's which just kept getting louder as the Vodka Waters kept coming. Aside from that, great ambiance. Food - We went with the "Feed Me" option. Great if you want a culinary adventure (or you just can't decide on what to get because it all looks amazing)! The food was incredible. Such an interesting mix of flavours, textures, aromas...just amazing. I think the Chef came out to greet us and brought us stuff that wasn't even on the menu! What a treat! He gave us a bit of history of the dishes which was also super interesting to know and something you don't always get. Drinks - Cocktail menu looked great but they had half price wine that night so...yeah... vino it is! Our server was super helpful and recommended a great French wine that was medium bodied, earthy, and interesting enough to holds its own with the mixture of flavours in the dishes. Overall - An amazing dining experience! Would highly recommend it! Our friends are originally from Montreal (and a bit food snobby) and they were really impressed. One of them even said the Chef is on his way to a Michelin star! Great food, Wednesday half price wine was a nice surprise. 4 of us got a bunch of things to share. Menu accommodates vegetarians! Service was lacking, it was like our server forgot about us? Other than that, great experience. We’ve been following the path of Chef Haan for a few years and were delighted to hear he is now running the kitchen at SoSo. It was literally his second night on the job, but he has already made his mark. The dishes were original and created with care, with all the influences you’d expect from someone so well travelled. The Asian flavours were layered, with just the right amount of heat. We liked the room, too. Noise levels were great for a place oriented toward a younger crowd. Service was relaxed and professional. This place will only get better as it evolves under Haan. Tried SoSo Food Club for the first time last night with friends and we all loved it. 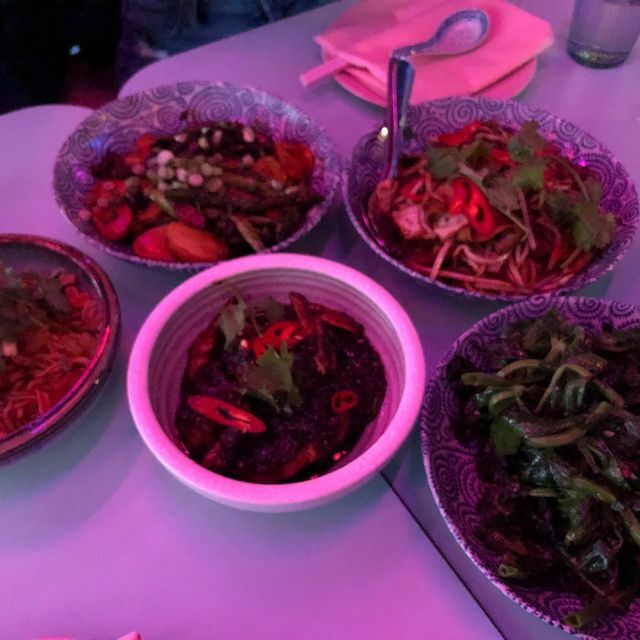 We went for the “feed me” option, where staff put together a meal for you, and loved what we got: smashed cucumbers, wood ear mushroom salad, and the sea bream to start, followed by the Chinese donut, black pepper prawns, meatballs, lamb biang biang, and the snow pea leaves. Capped it off with the oolong tea chocolate pave. Incredible variety of flavours and textures, hot and cold dishes, dishes with some kick to them and others to cool the palate. Everything was excellent, including the cocktails, and the sea bream in particular was stellar. Really loved the family style meal, so we could try so many dishes. Decor was cool and and despite being packed, it wasn’t too noisy (we sat in the back section). Would definitely go back and recommend to friends. Next level food, ambiance, and service! Our server Kevin was fantastic - attentive, friendly, and full of great insights about the menu. Highly recommend and will be back soon!! They recently hired a new chef and launched a new menu; still decent, but it was nowhere near as good as it used to be. My friends and I had an amazing time at SoSo. Love the retro inspired interior and the feature neon light covered ceiling, provided great ambiance for our night out. Some of our friends were returning customers while some of us were there for the first time. We were all pleasantly surprised by a brand new menu and were excited to try it. We had the Dai Style Smashed Cucumber, Wood Ear Mushroom Salad, Mouth Watering Chicken, Teochew Sea Bream, Stuffed Cheese Donut, Black Pepper Prawns, Dong Po Pork and the Bitter Almond Soy Custard. Everything was executed with superb attention to flavours, details and visual presentation. You can really tell that a lot of thought went into the composition of each dish. The dishes felt and tasted very home like but at the same time very new and creative. 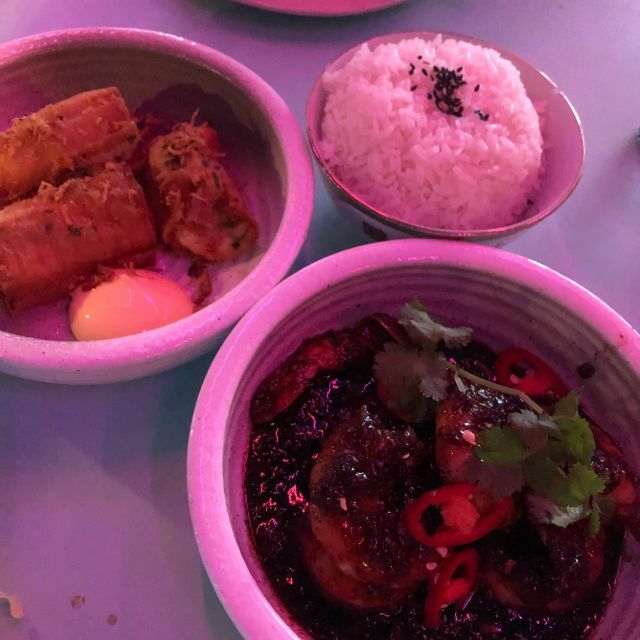 The dishes offered a lot of traditional interpretation of classic chinese dishes but created in an fresh inventive style either through flavours, shapes, or presentation. 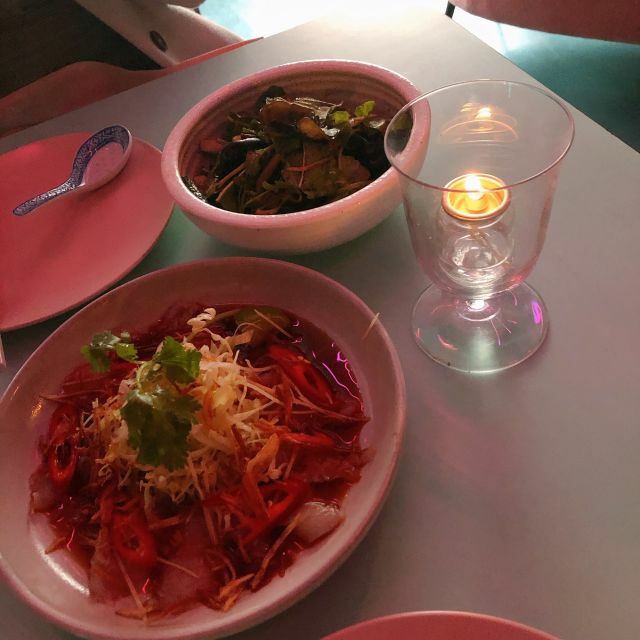 The cucumber and prawn dish both came with a very subtle spiciness, it was a lot of fun. The seam bream was excellently executed, absolutely loved it. There was so much happening with the mouth watering chicken, with roasted peanuts, century egg, ginger...!! The name is very accurate because we were all mouth watering over the dish. Rice Cake's sauce was very unique. The prawns were perfectly cooked and the sauce was a perfect pairing with rice. All of our ABSOLUTE favourite was the custard. If you don't eat the custard (one for yourself, no sharing), did you really go to SoSo? I don't even want to give it away, you need to try it yourself. I had the Mamahuhu cocktail and it was very very delicious. Others had the 1166 and were raving about it all night. Would definitely go again. Incredible dining experience if you enjoy Cantonese cuisine. Personal favourites from the menu: Wood Ear Mushroom salad, Teochew Sea Bream, and the Stuffed Chinese Donuts. All of the dishes had a high level of complexity in flavours. It’s nice to go with a group as the dishes are shareable. Great atmosphere, particularly the Miami vice colours and lighting. SoSo relies on it's ambiance. The service was awful. Unhelpful staff and unknowledgeable staff. The food is over priced and the menu is misleading... Ordered a lobster tofu dish, only to discover it was practically all tofu for $23. No one seems too interested in helping you when you get into the restaurant. They don't have a host so any staff member greets you at the front (unwillingly). Eventually, the pink lighting becomes sort of a headache, since you can't accurately see your food. Maybe it's a fun place to drink but overall, I think the place looks better/cooler on Instagram. I wouldn't suggest it to anyone. Great food and great ambience. How can you go wrong? Can't wait to try the rest of the new menu! The menu is not well rounded. There’s no mains that are substantial. They need to add on to their menu as the chef is very talented and all the dishes are very tasty. Excellent sauces on every dish. Just needs more fuller dishes. The food was delicious and the interior was very cool! Incredible flavor experience! A new head chef has put an amazing spin on the menu. Inventive, delicious and stunning combinations of ingredients. The stuffed fried savory donuts, woodear mushroom salad, prawns in a yummy sauce...I could go on and on. And the cocktails were spectacular! A must try, especially with a group of good friends. The shrimp should be served skin off to let the flavours into the meat. The chicken dish would have been amazing if served hot. Overall- very good. From our Hostess, to our Server to the Chef that came by to say hi and explain one of his dishes, we had a fantastic time. I highly recommend. Had poor service though. Had food and one drink and waited 45 mins to order another drink. Decided to get a drink elsewhere and no one came to check on us so walked up to the bar to pay my bill. Great tasting food, attention to detail, always delivere on flavor & presentation. hats off to the chefs. Great food - good service - fun atmosphere- highly recommended- chinese burger!!! I had a blast at SoSo last weekend for my birthday! Tabitha, our host, was absolutely amazing. All the staff are so knowledgeable of the menu as well. They had great recommendations. Also, the staff always slays! Super trendy and friendly. Hennia was another standout SoSo staff member that made me and my guests feel so welcome! This place has become my new fav hotspot in the city. Love the drinks, the food is SoSo good, and the lighting is amazing for pictures. I love that there's a female security guard too! I feel SoSo safe in this space! Ladies if you wanna have a good time and not feel uncomfortable on the dance floor...go here! It was a safe place to dance for sure :) Each time I've gone to SoSo I've witnessed couples who looked so in love. I feel like this space welcomes so much love and positivity. The atmosphere of the restaurant really draws in a great crowd of diverse people with all around good vibes. SoSo is a gogo! There’s a big mood and aesthetic here that’s not worth it. The restaurant is dark, music is loud, and the food is expensive for the portions you get. The dan dan noodles were probably the best thing on the menu but that’s about it. I had wanted to visit this restaurant for a long time but was severely disappointed by the food. Every dish had very little flavour. The worst was the noodle dish with peanuts - it was so greasy and had zero flavour! On top of the tasteless food the music was so loud we had to tell to talk to each other. Would never recommend or come here again. Was surprised how bad the meal was despite the hype! My favourite restaurant in the city, I’ve been many times, each time is amazing and better than the last. They have so many delicious vegetarian options! cant wait to come back soon!